Get Started Buying Selling Trading Concert Tickets Game Tickets and PSL's Today! Why buy your Steeler Seat Licenses from A Fan's Best Friend? We treat each and every customer with first class service, every time. You see and hear who you are dealing with, not trusting your dream to somebody at the other end of e-mail. You simply submit the offer and sit back while we do all the legwork. We provide you with the proper paperwork, secure the seats from the seller, and personally deliver all the paperwork to the Steelers. You just enjoy your new seats. We are available to our customers now and later. Whether its extra tickets, annual tailgate parties, more seat licenses or anything else, we're here for you! We've been in business for over six years and have successfully transferred hundreds of seat licenses and sold tens of thousands of tickets to Pittsburgh Steelers Fans. The expertise of our staff is second to none. We focus all of our attention on Pittsburgh fans and Pittsburgh venues. 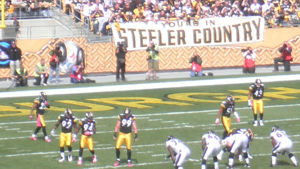 Find the Steelers Seat License you would like to purchase. Complete the form on the listing - be sure to place a bid! Once the offer is ACCEPTED, you have 7 working days to submit payment. Once payment is received, we begin the transfer paperwork. We meet with the Seller and obtain the required transfer documentation. We either personally meet with you at Heinz Field or we deliver for you the required transfer documentation from both the Buyer and the Seller. Your transfer is complete. We release funds to the Seller.